After nine and a half years and three billion miles, what image did NASA’s New Horizons spacecraft transmit back to Earth as it approached one of the farthest bodies in our solar system from the sun? A heart. But that’s not why I love this story. I love what this mission and its spacecraft, appropriately named New Horizons, represents in a time when many ideas and changes are creating divisions, especially among like-minded people. I loved the smiles and the laughter and the pats on the back the NASA mission team gave each other when New Horizons responded loud and clear yesterday with the information they had hoped to receive. From my side of the TV, I caught myself smiling with them, strangely feeling like I, too, had a part in this commitment to such a long-awaited, cooperative (and financially gutsy) effort. I love that the images we’ve already seen revealed that heart on the surface. Yes, it may just be a land feature that’s 1,000 miles wide and looks like Valentines Day (and the most recent reports say the enhanced images show more of a broken heart), but our eyes see things for a reason. I see it as a welcome mat as we enter a new horizon, not just in space but right here on Earth. I see a reminder of something we’ve known from the beginning, but traveling three billion miles over a decade has reminded us of again. I see it as—my apology for the cliché—a getting back to the heart of what really matters. As it gazes back at us on Earth, maybe a broken heart makes more sense. So what comes next, after Pluto? NASA says the New Horizons spacecraft could survive another twenty years in those cold reaches of space. Who knows what surprises it may send. And what comes next down here, on our planet? I’m sure more surprises. But about that heart. 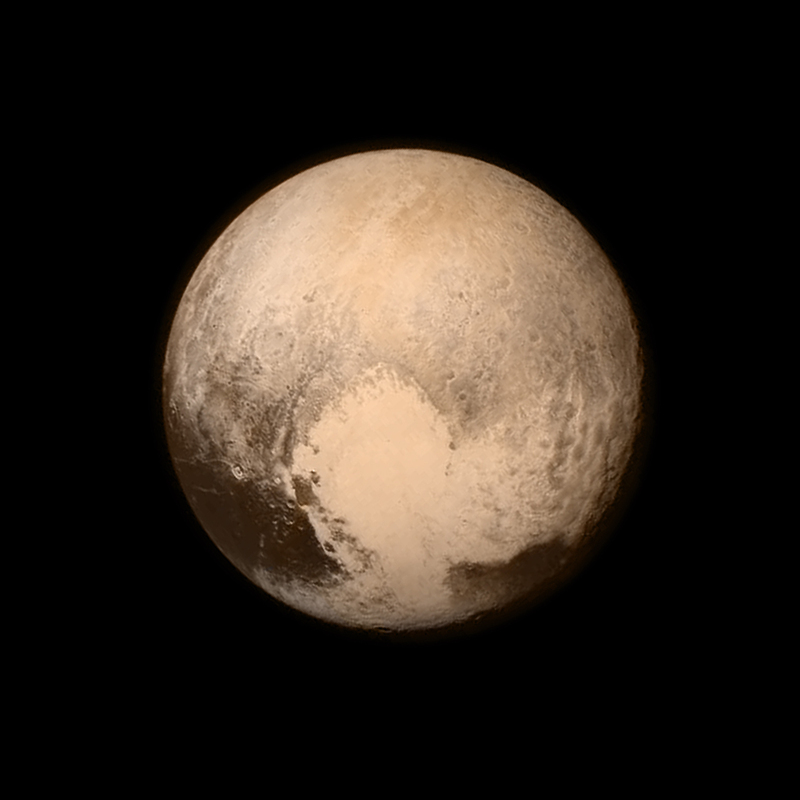 Yes, that heart, floating in the margins of our solar system. I wonder how it got there. I wonder why. And I wonder, does it matter? Who knows. I just can’t imagine though, seeing wonders such as this and not at least considering that it was put there by an Artist, that there is more to the story. And the smile He must have had this week when, after all of human history, we finally discovered it. Featured image by NASA (NASA/APL/SwRI). Used with Permission. Source image here. Brock. Cool post. We are so excited about this nether regions of our own star’s orbit. Then take a gulp and consider the heavens. Millions. Billions. And where does it end? Thanks, David, and I’m right there with you. When you start looking at how much space is out there in our tiny little solar system alone, and then consider how many solar systems are in our galaxy, and then consider how many galaxies there are in the universe, and what we see through telescopes like Hubble that are still only glimpses of what’s out there. Incredible. Mind blowing.